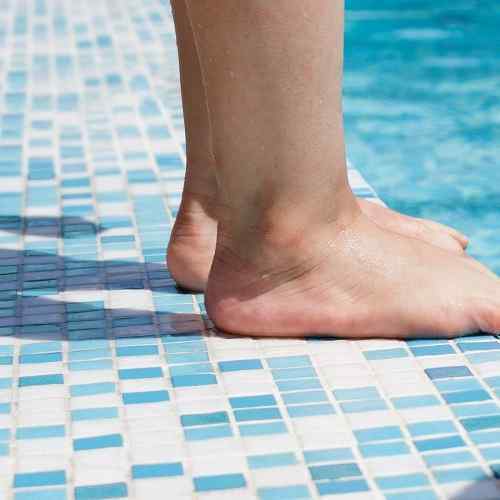 Having a swimming pool is absolutely a great idea to enhance the value, beauty, and comfort of your property at the same time. 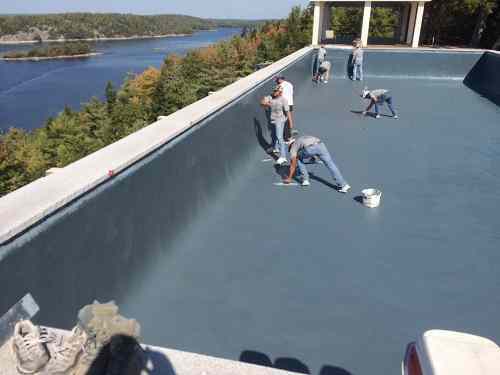 It offers tons of benefits for everyone, so you will never go wrong to build a swimming pool in your own house. 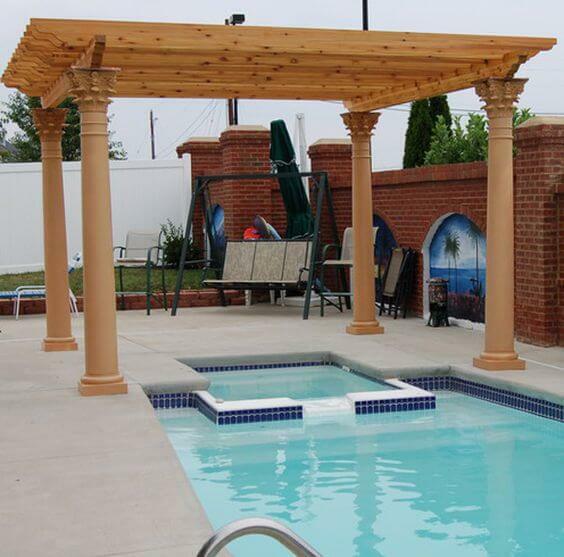 Installing a pergola can be one of the best ideas that you can consider to enhance the beauty of your swimming pool. Moreover, the pergola also works really well to filter the sun exposure since it’s basically designed as a shade. In other words, a pergola can both decorate your swimming pool with the mesmerizing look and provides the great comfort when you enjoy the pool. So, it’s so undeniable that a pergola has tons of plus points that you will earn. If you are not convinced enough, here we have picked lots of pergola pool ideas that will surely inspire you to have one. 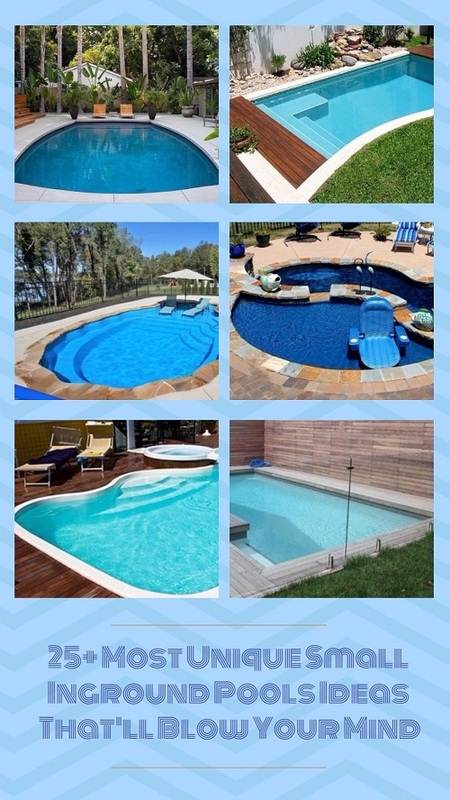 They look so awesome to style up and improve your swimming pool at the same time. 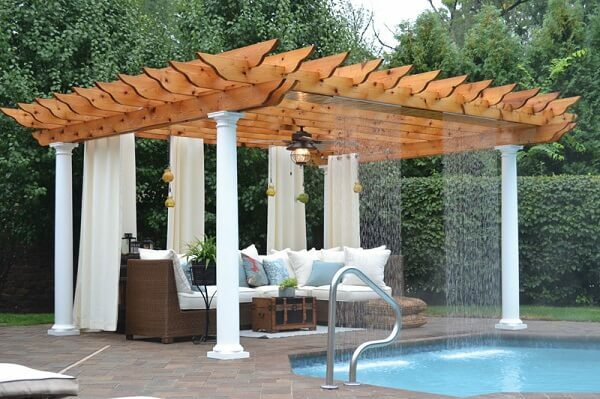 Well, let’s just keep scrolling to check out our best picks of pergola pool ideas! A huge pergola pool with the full shade design covers half part of the pool which makes it look way more inviting to enjoy. 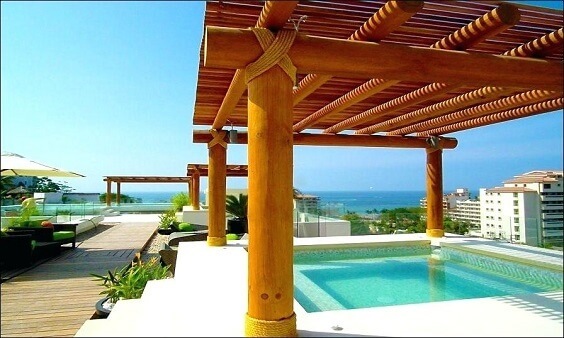 The finish of pergola in the wood look even adds a fresher vibe to the pool area. The combination of naturally-finished wood panel and black steel frame of this pergola pool makes it look modern and natural at one. It surely adds a unique touch to this outdoor living space. A superb pergola which comes with the built-in fountain for your maximum swimming pool enjoyment. 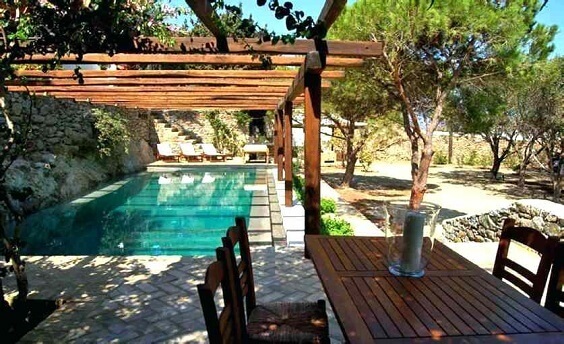 It’s a perfect option for you who want to have a ‘next-level’ pergola pool. 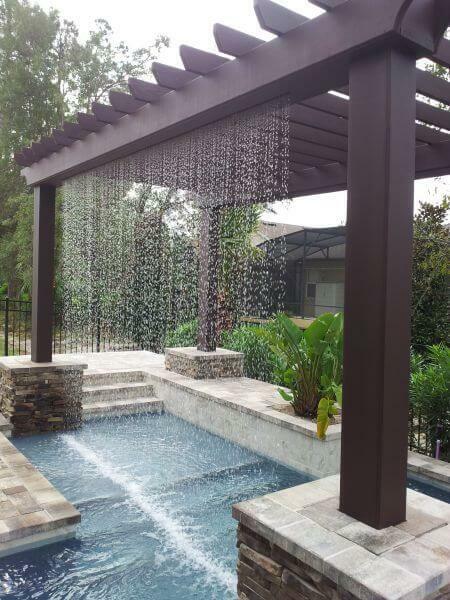 This idea shows a pergola pool which works both to shade the pool and patio. The size of the pergola is huge enough to cover those areas at the same time which is so tempting to copy. Basically, this pergola works to shade the patio which is built close to the pool, but its protruding design also covers a small area of the pool. It’s surely an easy design which is so worth to try. 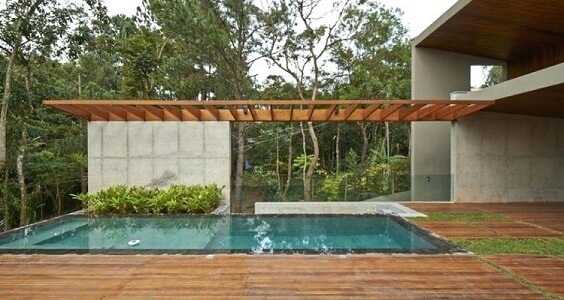 A unique pergola pool with the twig shade which looks beautifully earthy. 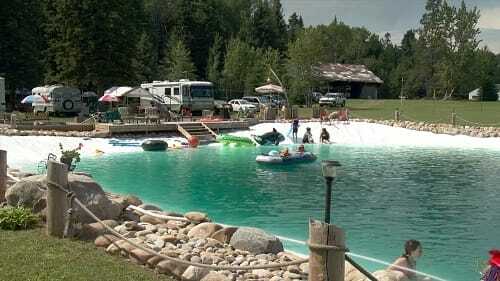 It can be a good inspiration for you who have a lap swimming pool. 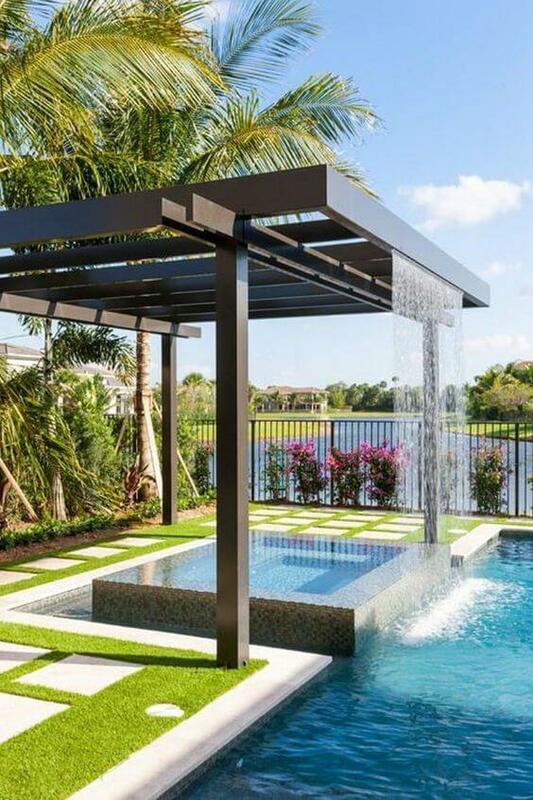 If you are looking for the pergola pool with classic design, this one should be added to your inspiration list right away. It has a gorgeous combination of traditional look and rustic finish that you will love. Another pergola pool with fountain and this one is designed in a more minimalist style. The clean-lined shade and posts in espresso finish are so admirable to make your swimming pool look and feel more inviting. 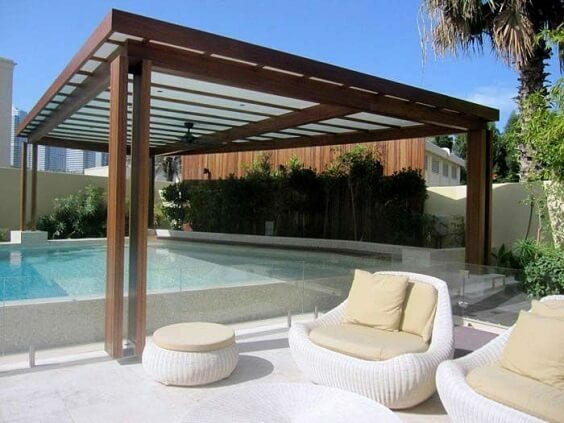 The design of this pergola still lets the sun to brighten up the pool area maximally. It works best for you who needs the one which works to decorate your outdoor living space. This kind of pergola offers a more practical feature in which you can roll up the shade when you just don’t need it sometime. Usually, it comes with the steel post and military-grade fabric which is obviously so tempting to have. 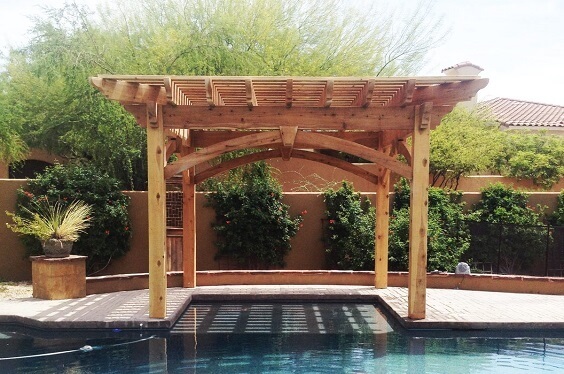 The unfinished-wood look of this pergola pool is distinctively beautiful to add a rustic touch to your backyard. Then, it also has the Victorian-style posts which surely enhance its beauty. the design of the pergola matches really well with the brick-style wall. 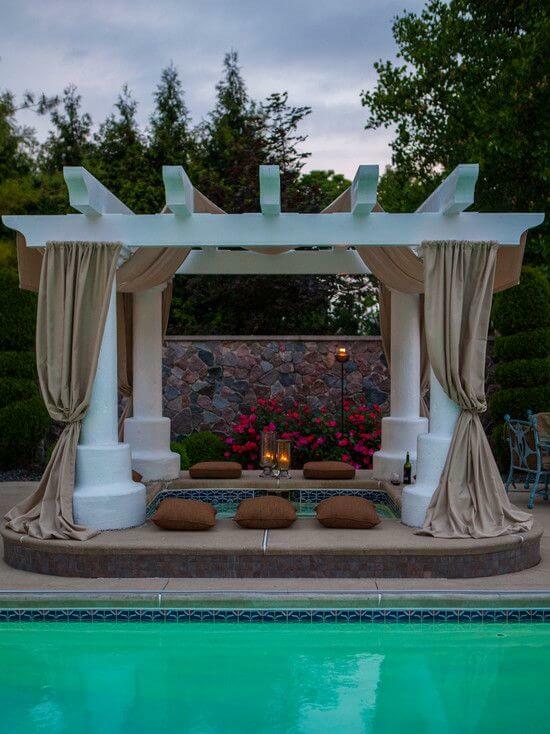 A stunning pergola with Mediterranean-inspired design in all-white style covers a small additional pool attractively. 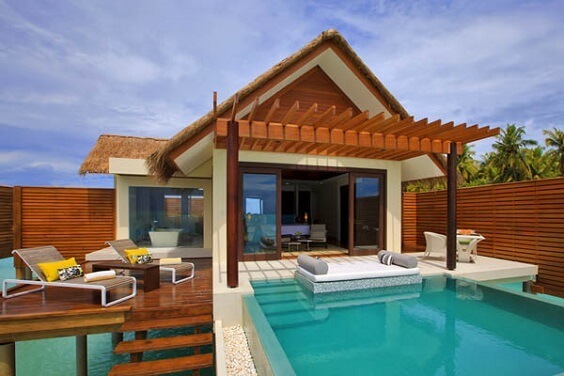 It also has drapes to provides better privacy when you enjoy the pool. 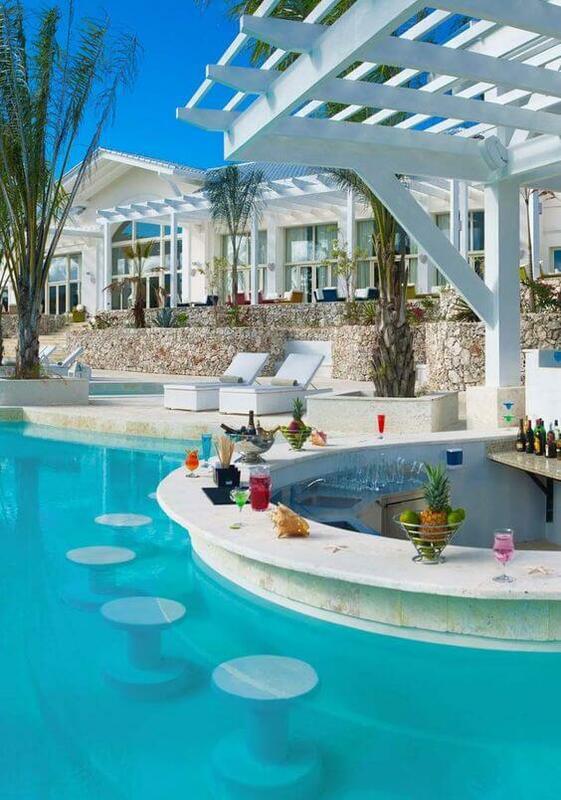 In this idea, the pergola works to shade the bar which is built inside the pool area. It’s finished in white which matches beautifully with the bar decoration. 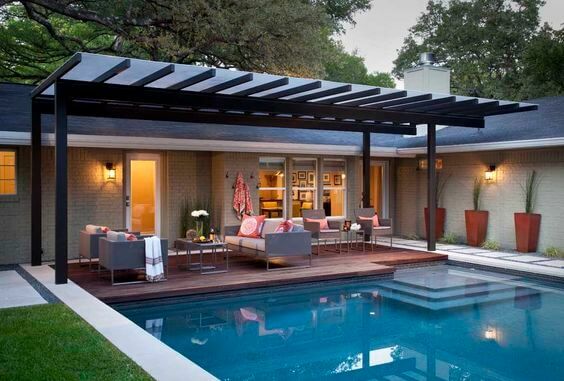 A huge pergola with home-style design looks so stunning in covering the small pool and patio. The design of the shade is inspired by the classic home which blends well with the overall nuance of the house. 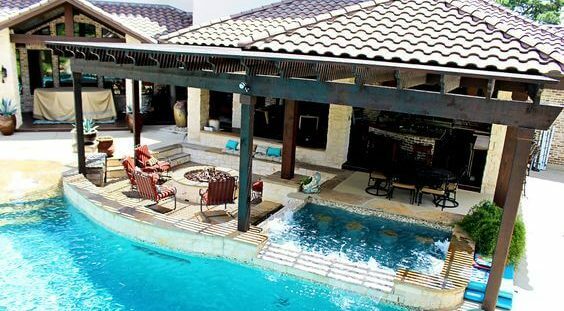 The design of this pergola pool looks so outstanding with its spiky shade which brings the style of this beautiful pool area to a whole new level. To blend with the rustic decor of its surrounding, the pergola is finished in rustic look gorgeously. 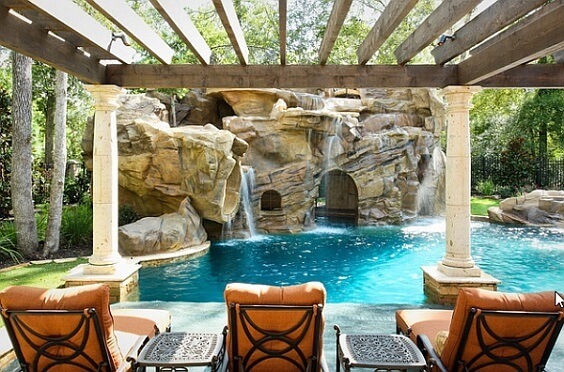 If you are looking for a much simpler pergola pool design, this idea is one of the best options that you can refer to. The design consists of the wood plank in similar shapes which are made into the shade-like construction. 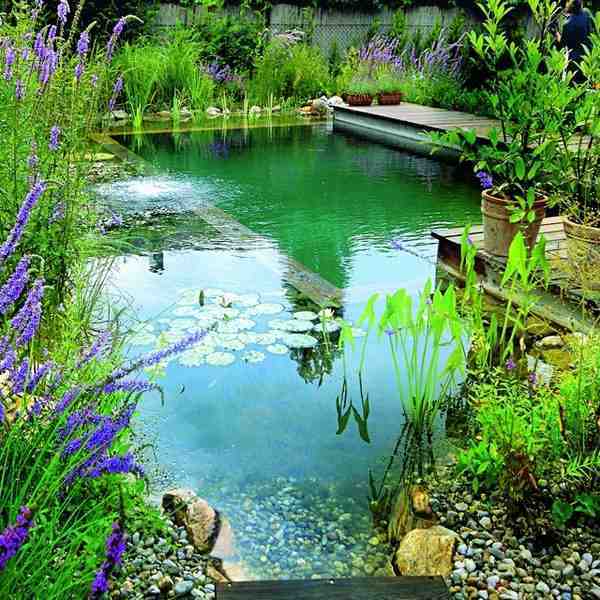 It works better for a small or lap pool that you can build quite effortlessly. 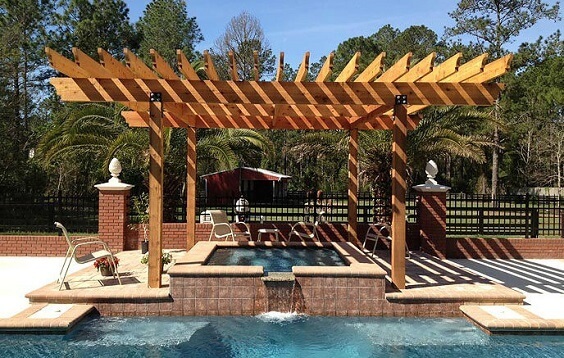 The posts and shade base of this pergola pool are made in log style which makes it look distinctively stunning. You can see the rope accent adds a more stylish touch in a very simple way. A mesmerizing huge pergola in rustic finish looks so beautiful with its green surrounding which is perfect for you who lave natural exterior decoration. It creates a jungle-like nuance which makes your pool moment feels way more exhilarating. 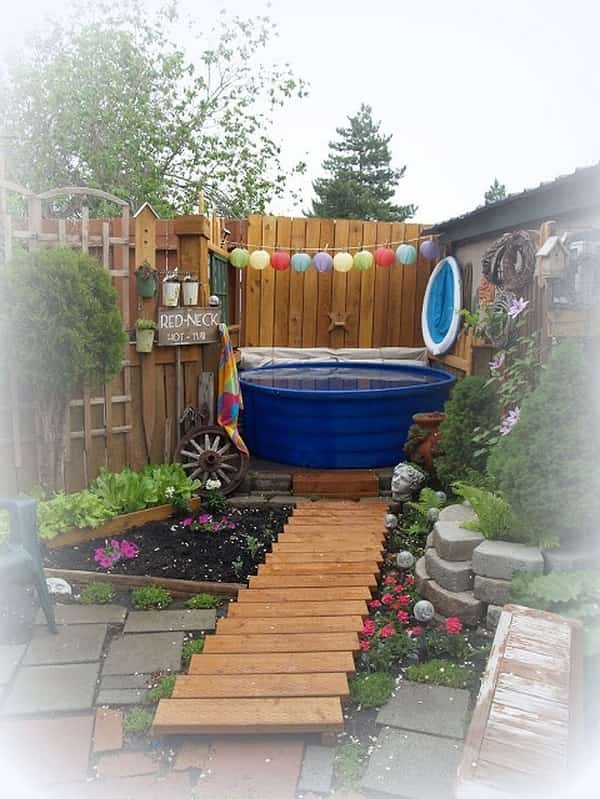 This one is a pergola pool with a natural rustic finish and wood-grain look. The design looks so admirable with the arch accent. It’s built in a small size which is meant to shade just a small area of the pool but surely enough to make it more comfortable to enjoy. A pool pergola which looks outstandingly attractive with the combination of white posts in classic design and rustic wood shade. 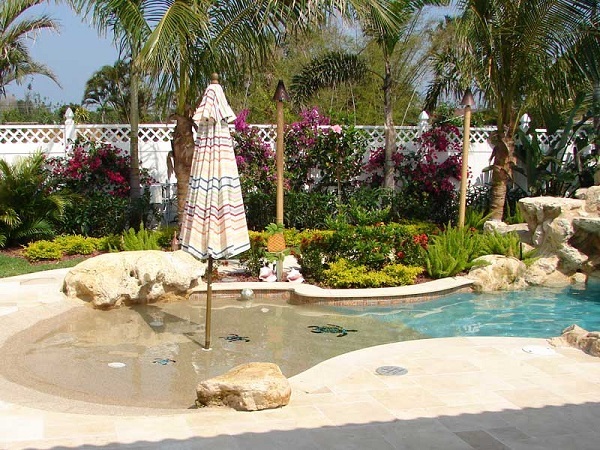 Moreover, it also comes with a fountain which absolutely makes it more fascinating to have. 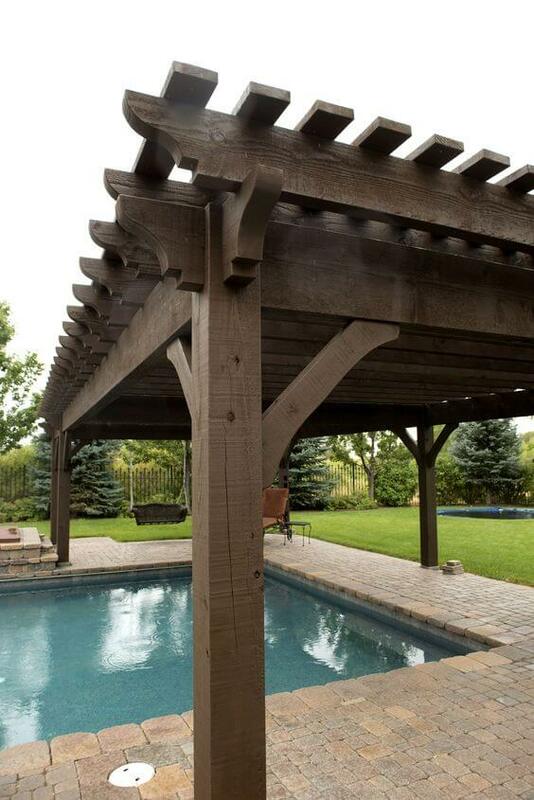 Again, this pergola pool with rustic weathered shade is supported by pedestal-style posts with a distressed finish. Such combination makes the pergola looks gorgeously vintage which will enhance the beauty of your outdoor space in a very distinctive way. 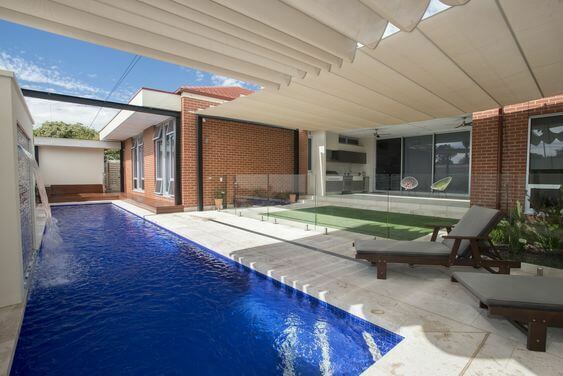 A simple pergola shades the ‘floating’ sitting area of a swimming pool fabulously. The resort-style design of the house makes the pergola look even more mesmerizing. 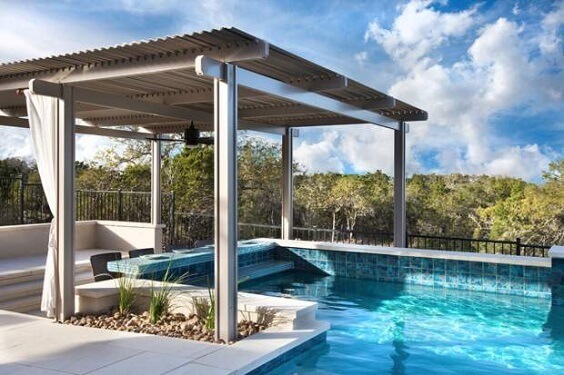 Of course, this pergola pool is the most different one from the others with its posts-less design which is perfect to add a superb contemporary style to your home. 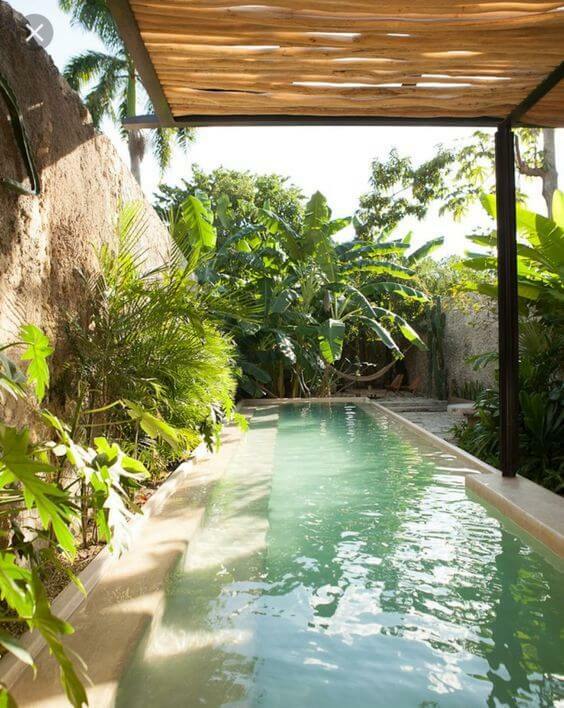 The shade is supported by the concrete walls which makes it look like floating above the pool. 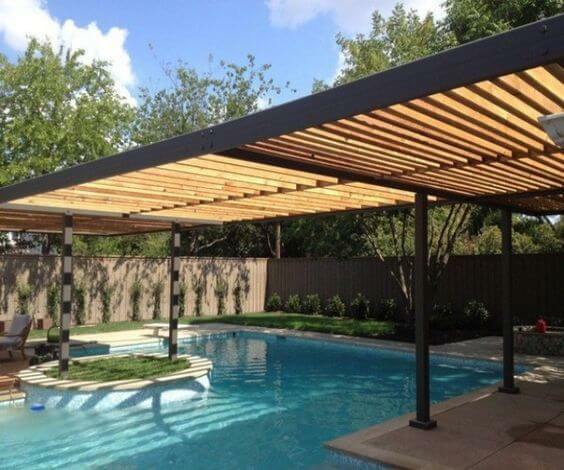 Well, those are some amazing inspirations of pergola pool that you can use for the ultimate reference. Pick the best idea that suits your needs and taste now!